For the final installation of this year’s HBO Bryant ParkSummer Film Festival presented by Bank of America, we are pleased to announce that we will be screening E.T. the Extra-Terrestrial. Released in 1982, this movie is a modern classic loved by children and adults alike. E.T. the Extra-Terrestrial examines the childhood idea that the world is vast and full of opportunity, but at the same time occupied by adults and their responsibilities. This paradigm is manifested in Elliott (Henry Thomas), a young boy living with his single mother (Dee Wallace), his older brother Michael (Robert MacNaughton), and his younger sister Gertie (Drew Barrymore). His lonely, disconnected nature leaves him out of touch with the world around him. One day while searching for something in his backyard, he senses something watching him in the woods. To his surprise, he finds a ten million year-old alien botanist (whose walk was simulated by the noise of a wet T-shirt crammed with Jell-O) left behind from an alien spacecraft that was on a scientific exploration of Earth. The stranded extraterrestrial, E.T., relies on Elliott to help get him back to his home. After overcoming his fear of E.T., Elliott is not only able to help E.T. rig a communication device to contact his planet, but he also learns how to engage in his own life. The only threat: government scientists threatening to take E.T. for their own research. Director Steven Spielberg was meticulous in how the movie was created in an attempt to make each scene as genuine as possible. 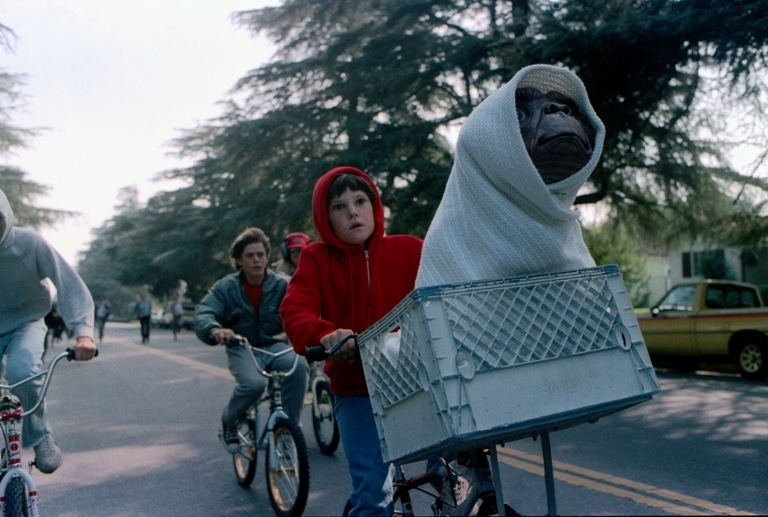 For example, you'll notice that most of the film is shot at the eye-level of a child to allow the audience to better connect with Elliot and E.T. The communicator that E.T. constructs was actually functional and created by Henry Feinberg who worked in technology interpretation for the public. And Spielberg even went so far as casting real emergency room technicians as the doctors and nurses in the film. The measures Spielberg took were so effective that even as an unofficial entry at the Cannes Film Festival, E.T. received a standing ovation, which had eluded most of the official entries. In addition, it became the highest grossing film in history until Spielberg superseded his own record with “Jurassic Park.” Despite being beaten in more recent history by the likes of James Cameron’s “Titanic” and “Avatar,” the movie is still the fourth highest grossing of all time when adjusted for current inflation. Come on out for the last movie of the Summer! Hester Street Fair will be on the putting green one last time before the end of the season, so don’t miss out on a chance to try some of the gourmet vendors. Thank you for making this year’s Film Fest such a success, and we can’t wait to see you for the grand finale. Intrigued? You can learn more about the film and prep for your Monday screening with also a clip of Siskel and Ebert's original 1982 review of the film.